Fully Tested in Excellent Working Condition. 20 years of experience in hi fidelity crossover design. Up For Sale Is A Acoustic Research SC-2 Center Channel Speaker 2 Way. This is very nice center channel and it sounds great. The speaker does have a small bubble in the veneer I tried to take a good photo of it. 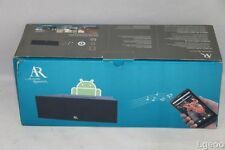 Acoustic Research Wireless Audio Speaker System 1000002737 044476086564. Acoustic Research PS2052 Bookshelf Speakers - Work Great ! I have 2 pairs of these, price is for 1 pair as pictured. Work great, sound great. Cross-over upgrades (all crossover components). 20 years of experience in hi fidelity crossover design. 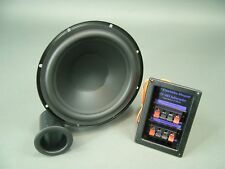 This woofer fits many AR 10 " applications. Perfectly centered voice coil with 30 hz signal. 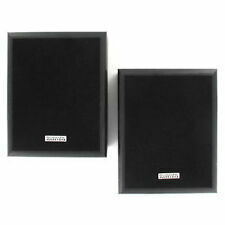 ACOUSTIC RESEARCH AR-132 SPIRIT Speakers PAIR NEW IN BOX!!! RARE VINTAGE! 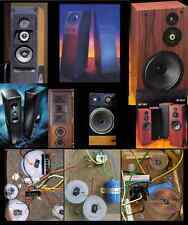 ACOUSTIC RESEARCH AR-132 SPIRIT Speakers PAIR NEW IN BOX!!! RARE VINTAGE! BRAND NEW IN BOX! THIS LISTING IS FOR THE PAIR! THEY ARE BRAND NEW. STRAIGHT OUT OF A TIME CAPSULE! THESE WERE NEVER POWERED! CHECK THE PICTURES OUT! VENEER IN EXCELLENT CONDITION! AR-132 Spirit Model: AR-132 Spirit Manufacturer: Acoustic Research Type: Speaker - Audio Year: 1989-1992 Woofer Configuration (1) 8" Tweeter (Horn) Configuration (1) 1" Enclosure Type Acoustic Suspension Sold as pair. --- ---. Used in excellent condition. Pulled from a working unit. Includes grill/cover Grill. Bluetooth - stream your music wirelessly from your smartphone, table or PC. Distinctive Audio - 2 way speaker system plus enhanced bass radiator. Do wireless connections work and stay working?YES. Here's what we test for. Impressive 10 Watt sound system includes a mid-range driver, tweeter and bass resonator. Enjoy music wirelessly from your smartphone or tablet with Bluetooth. Weather resistant design for indoor and outdoor use. Acoustic Research - Subwoofer S108PS - Black. Speaker is used ,has been tested and functions properly, sound is great. Has two small chips to finish at bottom of front corners and little blemishes down left side.Please see pictures I have tried to show condition as best I can. Tested Working onsite, unit is fully functional. Includes unit only, no power cable, or other accessories. Unit has Heavy wear from previous use, including scuffs, scratches and blemishes. Unit is on hand and ready to ship!. This is a very nice Acoustic Reaearch Athena Subwoofer. This unit is in very nice shape. One Cerwin Vega Sub Woofer Cross Over( Sub crossover point is just above 200 Hz. ). 8" Dual Voice Coil Sub Woofer Consisting of Premium Components from Cerwin Vega and Acoustic Research. 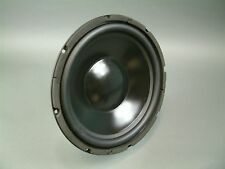 One Acoustic Research 8" Dual Voice Coil Sub-Woofer. 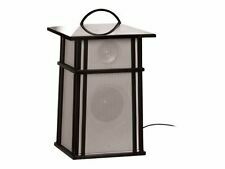 Nice indoor outdoor acoustic research The Edge Sequel speaker pair. Are designed to hang. As you can see in the pictures and they sit on a hard surface they actually Lean back considerably. a few scratches and a couple of white scuff marks on the outer casing but nothing major. Good condition. Minor marks from use. Works perfectly! This center channel speaker works well. Enjoy music with Acoustic Research WS2PK63 Wireless Speakers 900MHz technology and included transmitter. High-quality, full, rich sound anywhere - outdoors, indoors or on the go. 2 x Speakers. High-quality, full, rich sound anywhere - outdoors, indoors or on the go. The system is expandable so you can add multiple units to the AW828 to enhance both your outdoor listening and gardening experience. Each speaker operates on 6AA batteries (not included) or AC adapter (included). Indoor outdoor speaker. 1 Speaker in the box. For a smoother response and improved durability, the driver uses a rubber surround. Power On/Standby LED: Glows green when the subwoofer is on and glows red when the subwoofer is in standby mode.Whats Included. Nice Little outdoor speaker- great for taking out to the patio and if you get a second speaker you can link and turn them into stereo speakers or even grab a few and link all together. While not the best outdoor speaker I have ever heard the portability really makes this one a no brainer- take it where you want and and hang from where you need. AR Acoustic Research 206 HO Two-Way Bookshelf Speakers...NICE! This is a Beautiful Set of AR Acoustic Research 206 HO Two-Way Bookshelf Speakers. These CRANK!!!! 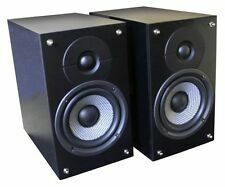 STUDIO PARTNER MODEL AV-8 POWERED SPEAKERS. SELF CONTAINED AMPLIFIER. 120V, 60 WATTS. System Specification System Type: Fully self-contained powered stereo bookshelf acoustic suspension two-way loudspeaker system with driver units in a vertical array Drive Units: 8" (200mm) filled polypropylene cone acoustic suspension long-throw woofer, 1-1/4" (32mm) liquid-cooled cone tweeter Acoustic Output: Each loudspeaker is capable of delivering peak sound pressure levels at 1 meter in excess of 105 db SPL Power Requirements: 120 volts, 60 Hertz, 60 watts Amplifier Performance: 16 watts per channel with less than 1% total harmonic distortion, 50 to 20,000 Hz with 2.3 dB headroom. Acoustic Research 1ms Mini System Book Shelf Loud Speakers | Made in Japan (New! Totally functional and cared for. Great bass. Original box. A pair of Acoustic Research AW825 Speakers with 2 wireless audio transmitters power supplies and cables. Very good condition. Enjoy music wirelessly from your smartphone or tablet with Bluetooth. Dynamic Audio - 10 watt, 2-way speaker system plus enhanced bass radiator for amazing audio performance and almost no distortion. For Sale - Lot of 3 AR Acoustic Research The Edge Indoor / Outdoor Speakers w Stands. Mode3l ULT0100712 in good working condition. Used and show normal signs of wear. Being sold as is. 6520 Hwy 301 South. HAVE ISSUES USING THE BLUETOOTH ON THE UNIT. Avoid using abbreviations and acronyms whenever possible.